Why did I choose this? When I looked more closely at the PICStep design it required two LMD18245T drivers per axis. Digi-key sells these for about $13 each. That adds up to 6 x $13 = $78. Plus each driver has a $3 PIC microcontroller, so the PICStep drivers are at least $87. On top of that an interface between the drivers and the PC is required plus some minor bits and pieces for the drivers. The interface is pretty simple and would cost maybe $15. So the total is around $105 plus shipping for the parts. It may be possible to find a slightly cheaper microstepping driver, but it would likely shave off just a few dollars per driver. If anyone has any specific drivers and totals please post a comment. Next issue was the motors. I wanted motors that other people could purchase to get the same results. Reproducability is a key aim of this project. That means no surplus or used motors where the exact specification is not known. So I was looking at new motors. Also the motors have to have enough torque to drive the drill bit into the material and move the platform around, pushing the material into the drill bit. No exact figures are available but I get the impression that at least 120 oz-in is needed to avoid having the motors stall, and in general the more torque the better. The cheapest motors I could find with a suitable specification were item 11A from Keling, Inc. at $30 a piece. The total would be $90 plus shipping. Now compare these figures to the Hobby CNC combo. I get all the electronics and 305 oz-in motors, which are more than twice as powerful as the ones from Keling, for $160 plus shipping, which is less than I would be paying for the PICStep approach. Plus I can be sure that the motors will match the electronics and Hobby CNC provides technical support. Also I get 1/16 microstepping instead of 1/8 with the PICStep. 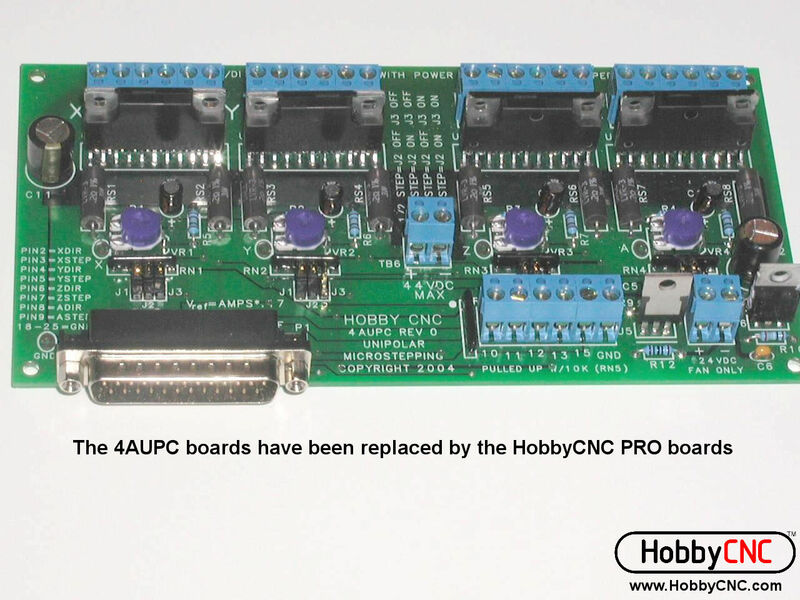 Now I suppose it would be possible to redesign the PICStep drivers to use cheaper motor driver ICs, such as the ones used by the Hobby CNC board, but I don’t have time to do that right now. I want to get my CNC machine up running and then maybe redesign the electronics later. Print article This entry was posted by Andy on October 9, 2007 at 10:22 pm, and is filed under CNC. Follow any responses to this post through RSS 2.0. You can leave a response or trackback from your own site.